When you are dealing with incontinence there are a number of incontinence products on the market that you can turn to in order to make your condition manageable. Finding the right type of incontinence products will help to make your life easier as you can go out in public again without worrying that you will have an incontinent episode. If you do, your incontinence underwear will be there to capture the urine loss that occurs. Adult diapers can become quite expensive as you can easily go through several pairs a day. A great way to make managing incontinence easier is by using reusable incontinence briefs. The reusable incontinence briefs are beneficial as they allow you to save money. You will wash them after each use and they come in a variety of different options. Many of the incontinence briefs on the market look quite similar to the underwear you are already used to wearing, making it easier for you to adjust to them. It also helps to prevent others from being able to notice that you are wearing incontinence products. Sometimes the adult diapers can be a little noisy when you walk, making it easy for other people to quickly identify that you are wearing adult diapers. The daytime incontinence briefs are usually lightweight but they do have extra absorbency ones for individuals with severe urinary incontinence problems. You also have the option to purchase some overnight reusable incontinence briefs that will protect you from accidents at night. In addition to the briefs it is also smart to invest some of your money into some incontinence bed pads as they will protect your bedding. How can you find quality incontinence products? The best place to find them is by shopping online. Online sites come with several options to choose from, making it much easier for you to find a great selection. The local stores often have a small selection of adult diapers and some of them do not even carry reusable incontinence briefs. Some of the online selections you have to choose from also include other things as well like lace and colors, making it simple for you to really hide the fact that you are wearing incontinence products. The other great thing about shopping online for incontinence products is that you can usually get them for a lower price. You also don’t need to worry about the embarrassment of walking around a store with a big bag that says “ADULT DIAPERS” for everyone else to see! Online shopping definitely makes it much easier for you to be able to manage incontinence in a discrete. The reusable incontinence briefs are great as they actually move with your body. They are beneficial because you will be able to still carry on your normal routine. If you like to run and exercise, the reusable incontinence products are great because they do fit to your body. The cost of reusable incontinence briefs can give you a huge financial relief compared to the cost of the disposable incontinence products. The reusable incontinence products can last for a longer period of time as you can purchase them and have them for use for several months or longer than a year. It all depends on the type of incontinence you are dealing with and how often the diapers are being washed. The washable products are great as they are sanitary since you can toss them right into the wash instead of leaving them in the garbage can for several days. Reusable incontinence briefs are one of the best options when it comes to managing incontinence in a discrete and “green” manner! 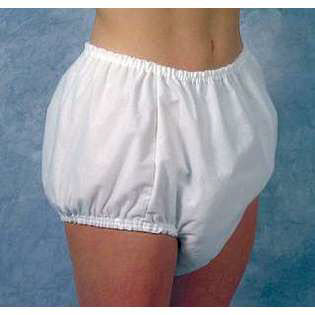 I like the idea of cloth diapers and waterproof pants as a means of managing incontinence.